We believe that the quality of a piece of furniture, or any other endeavor, is a direct reflection of the quality of self one is willing to invest in the effort. EXCEPTIONAL CABINETRY IS INVARIABLY THE PRODUCT OF EXCEPTIONAL PEOPLE. The Art of Cabinetmaking comes alive in the eye and hand of a master craftsman. Gifted makers are rare, and we are truly fortunate to have assembled the select group of individuals who work in our shop. Enormous versatility is required of them to accomplish the wide variety of projects our custom shop is asked to design and build. No matter how high the level of skill our cabinetmakers achieve, they continuously rise to the challenge of expanding their individual and collective expertise. Today’s custom cabinetmaker must be as deft with modern woodworking equipment as our predecessors were with chisel and mallet. At tasks for which today’s tools cannot possibly replace the skilled touch of a craftsman, he or she must also have mastered the hand tools of earlier eras. The cabinetmakers in our shop are masters of both. Ours is a shop where the artisans shape their work environment to maintain the creative flexibility and quality control necessary for the finest, custom woodwork. Yet, some of the most important work we perform actually takes place outside of the shop, in the homes of our clients. When truly custom cabinetmakers invest their unique skills in a project, they want to be sure that the installation of the work will be given the same careful attention on the job site. In the end, the ultimate success of any design rests in the hands of the craftsmen. The choice of individual boards for their color and grain pattern, the grace of a curve, the snug fit of an exposed joint… these are the constant concerns of our master cabinetmakers… these are the creative contributions they make to the homes and lives of our clients. Where our artisans shape their work. Located nine miles north of Charlottesville, Virginia, our 5,000 square foot shop, in the refurbished railway depot at Burnley, houses a sophisticated array of modern woodworking equipment. However, it is the outstanding talents of our dedicated craftsmen that account for the exceptional work our clients have come to expect over the years. We welcome prospective clients to visit, whenever they are in the area. We work wherever we are needed, and encourage people to contact us from anywhere in the country. Many of our clients refer to their difficulty finding the quality of design and craftsmanship we provide, in their immediate area. Over the past few years we have worked on Martha’s Vineyard and Nantucket Island, MA; Long Island, NY; Sanibel Island, FL; Wilmington, DE; Charleston, SC; Hilton Head, GA; Chicago, Il; Cherry Hill and Montville, NJ… along with the numerous projects we design and build for the Washington, DC area, Richmond, Norfolk and elsewhere across Virginia. Long distance projects require an initial site visit, and perhaps a second visit once our working drawings have been completed. Most often, we are asked to install our own work, however, the drawings we create are so extensive and well detailed, that we can consider delivering work to be installed by others. The entire time we are developing a design, we are considering the personality of the wood to be used. A TECHNICAL UNDERSTANDING OF WOOD’S CHARACTERISTICS IS ONLY THE BEGINNING. Those who work in our shop share a passion for beautiful wood. We understand that successful design is the union of aesthetic intention with the characteristics of this natural material. Each species yields lumber of a different hardness, density, texture, and color. Each tree within a species develops its own patterns of rings, burls, curls, and crotches. The direction in which the lumber is sawn from the log reveals spectacular, individual characteristics. For the custom cabinetmaker, a technical understanding of each wood’s character is only the beginning. 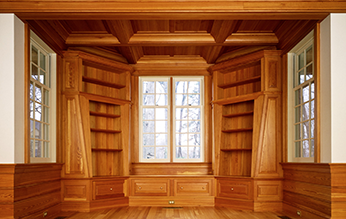 A cabinetmaker’s experience leads him to speak more often of a wood’s "personality." Koa and Bubinga are exotic, not just because they are imported, which is all "exotic" technically means, but also because they excite our imaginations. Black Walnut and Rosewood connote a rich formality, as distinctive as Cherry’s overtones of enduring warmth. Reclaimed Heart Pine veritably exudes a worldly antiquity, commensurate with the age of the timbers from which it is re-sawn. These characterizations reflect our intimate experience with a wood in its most appropriate applications. Oak has long been preferred for drawer parts because it is hard enough to resist ware… thus its connotations of smart efficiency and steadfast durability. Mahogany’s workability with hand tools made it the favorite of 18th century makers, so it virtually speaks, "tradition." The entire time we are developing a design, we are considering the personality of the wood to be used. We are consulting our extensive sources of supply, checking on the availability of the figure and color we demand, and scouring new sources for new varieties. We continuously search for woods that bring out the best in our designs, while constantly exploring designs that make the most of beautiful wood. There are few natural materials with which people have so intimate and personal a relationship as we have with wood. Along with our love of wood, we enjoy incorporating other materials in our work. We look for opportunities to collaborate with other artisans whose mastery of different media can lead us to new ideas. Whether we are working with a black smith to design special hardware, a glassmaker on stained glass panels, or a stonemason facing a fireplace surround, we revel in their creative efforts, and the look and feel of their materials.